If you work in a medium or enterprise business, chances are that this scenario sounds familiar to you: business users switch regularly between different business systems in order to get their job done. The companies ecosystem lacks on logical bridges between multiple business systems, like BPM, ERP, CRM, SCM, SRM, PLM and others, that generate data within the company. As a result, users ignore local ECM systems and often store documents on local hard drives, and, in order to see the whole picture, search for the needed structured and unstructured data manually. This not only takes a lot of time but also does not guarantee, that they find all the needed information they were looking for and in the latest version. A study by AIIM shows that 61% of workers report that they operate in an environment where their lead application does not connect with all other business systems. With OpenText™ Extended ECM Platform, content is transparently integrated with other leading applications such as SAP®, Salesforce®, Microsoft® Office 365® or any other business software. With integrations, the content services platform bridges content silos and business processes to allow information to flow effortlessly across applications. Extended ECM Platform leverages an organization’s investment in its enterprise content management software and other applications, while improving transparency and insight to enable informed decisions, speed business processes, and make users happy. It doesn’t matter if you deal with large volumes of business content from sales, marketing, production, research and development that include correspondence, documentation of any kind, like contracts, production or service records, etc., OpenText Extended ECM can help you manage and connect all this content for faster user experience. 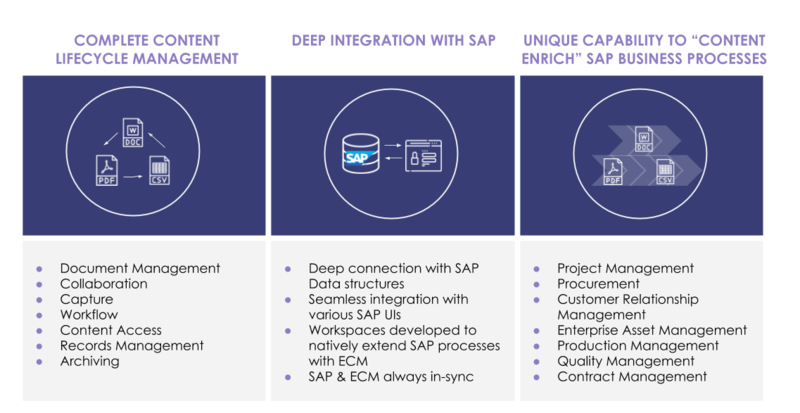 From the SAP point of view, OpenText offers OpenText Extended ECM for SAP Solutions, a solution pack that uniquely integrates with SAP Business Suite on HANA (SAP ERP, CRM, SCM, SRM, PLM) and S/4HANA. This integration adds data and document archiving, imaging, document management, collaboration, certified records management related to your SAP systems. Where mind-numbing responsibilities are removed to improve job satisfaction for your team. Where content can be accessed securely and intuitively anywhere on desktop, web, and mobile for both SAP and Non-SAP users. Where users can easily discover, share, search, and collaborate on everything from simple documents to invoices and contracts. Where users can view and access both structured and unstructured business content from a single interface, which will provide them with content in context without the need to switch between different applications. Where the company can change the economic value of their products by focusing on value and effective marketing. Where content services are extended into the organization’s foundational technology environment. Where it provides a clearer overview of products, customers, suppliers, and assets performance for improved decision-making. Where Extended ECM allows control of entire content lifecycle and maintains content integrity. 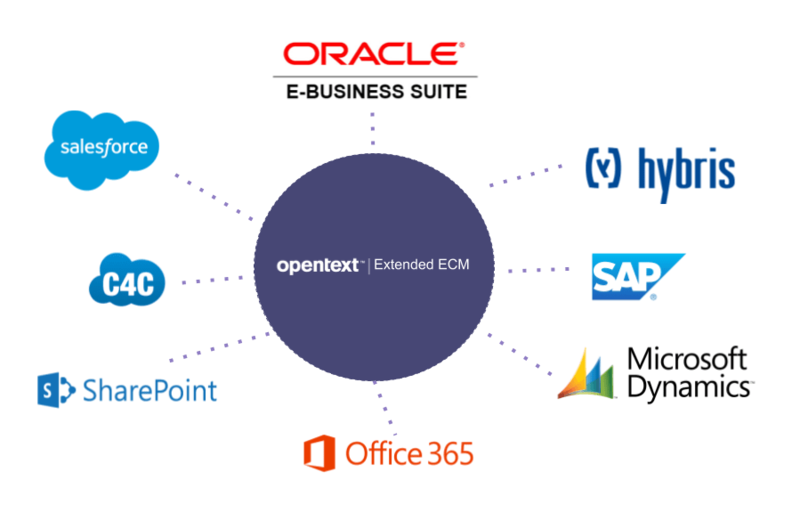 All in all, OpenText Extended ECM is a solution packed with some of the most powerful tools on the market. Extended ECM extends the capabilities of your content management systems to help you manage information within your company with a 360-degree profile and optimize procurement, employee productivity, process efficiency, and asset ROI. And the best part is that Extended ECM can be integrated with virtually any lead application, and thereby adapted to your specific needs. So, if you are interested in this area and would like to learn more about OpenText Extended ECM, contact Ecodocx. We’ll be more than happy to help.